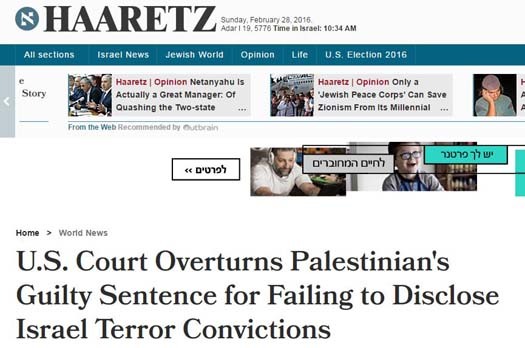 CAMERA’s Israel office today prompted correction of a Haaretz headline which wrongly stated that an American appellate court overruled the conviction of Palestinian Rasmieh Odeh in an immigration fraud case. A U.S. appellate court on Thursday vacated the conviction of a Palestinian activist charged with immigration fraud for failing to tell U.S. authorities she had been imprisoned in Israel for a 1969 supermarket bombing that killed two people. . . . The 6th Circuit U.S. Appellate Court opinion said a lower court should have allowed expert testimony that Odeh was suffering from post-traumatic stress disorder (PTSD) due to torture in prison, and did not know her statements to immigration officials were false. The appellate court said the lower court erred by excluding the testimony. The expert would have testified that Odeh’s PTSD caused her to interpret questions in a way to avoid any thought of her trauma, the court opinion said. The three-judge panel also vacated the 18-month prison sentence against Odeh imposed last March, and sent the case back to the district court. . . If the lower court decides the PTSD testimony is admissible, it will require a new trial. If the court finds another reason to exclude the testimony, the case will go back on appeal, Deutsch said. To “vacate” a legal ruling means to rule that it is null or void. If the appellate court “overturned” the guilty conviction, then the court ruled that the defendant was innocent. The court certainly did no such thing. A federal appeals court panel has overturned a Chicago-area Palestinian-American activist’s conviction for naturalization fraud based on her failure to disclose a terrorism conviction for a pair of 1969 bombings of a supermarket and the British Consulate in Jerusalem. CAMERA has contacted Politico to request a correction. Stay tuned for an update. For additional Haaretz corrections prompted by CAMERA, and our Hebrew website, Presspectiva, please see here.